This data broker plugin allows quick poisons/stones/oils applications on weapons (mostly for rogues, shamans and leveling characters with enchanting/forging). Right-Click for options. - Previously selected consumables are highlighted to help you refresh at a glance. - Consumables are filtered: fishing lures, sharpening stones and weightstones are only shown when necessary. This plugin supports Addon Loader and Skinner. - Fixed buff loss detection issue. - Fixed config menu layout. - Fixed a typo that was restricting weight stones, sharpening stones and some oils to wrong classes. - Quick fixed the buff canceling issue by removing the option that hide the weapon buff frame until I get a clean solution. - Fixed the 4.0.3 buff frame error. - Fixed the 0 stack poison issues. - Fixed shaman buff icons. - Temporarily re-added old poisons (damn it Blizzard!). - Added an option to skip confirmation dialog (set by default). - Added a 3rd block (throwing weapon) for rogues. - Added options to resize tooltip (ctrl+mousewheel the tooltip or edit config menu). - Fixed consumable list to reflect the 4.0.1 changes (old poisons with wrong IDs due to a Blizzard bug, will still be used by this plugin, but you will have to have at least one of the new poison to use as proxy). - Fixed saving previous buff used. - Changed background/border colors/opacity a bit. - Fixed enUS Mind-numbing Poison, really. 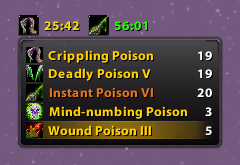 - Fixed Mind-numbing Poison icon (Rogue). - Fixed Earthliving Weapon buff (Shaman). - Updated the "Hide weapon buff frame" (now handles consolidated buffs). - Fixed a Blizzard bug that was preventing the popup notification to show. (using "BasicScriptErrors" instead of the UI function "message"). - Added an option to turn countdown timers off. - Added notification options. You can now select: chat and/or popup and/or scrolling battle text (supports MSBT, Parrot, SCT and Blizzard's FCT). - Added an option to delay popup notifications: if a weapon buff wears off during combat, the popup notification will hold until the combat ends. - Reworked the config section to be much lighter. - Added partial german (deDE) translations (thanks Privelgus). - Added Weather-Beaten Fishing Hat to the buff list (doesn't check if the hat is equipped and not cooling down). - Changed buff list filtering so that when a fishing pole is equipped, ONLY fishing lures are shown. - Changed buff loss notifications not to trigger on refresh/overwrite. - Fixed the "Hide low ranks" option not hiding the right ones. - Fixed the "No consumable available" entry showing the previous item quantity. - Added a shaman option to hide Rockbiter Weapon spell from buff list. - Added a default entry when buff list is empty. - Fixed an error that occured with low level warlocks not having learned their first firestone and/or spellstone. - Fixed the buff list showing after a buff replacement/overwrite. - Fixed the buff scanner that was stopping after the first green line (like +40 spell power) missing the actual real buff. - Fixed buff icons in several ways. It now better reacts to weapon switching and config changes. - Delayed the first weapon scan to make sure the game got enough time to load these informations. - Fixed the "Set text as buff" option. - Added hints and an option to toggle it. - Consumable/dose quantities are now instantly refreshed on use/creation. I got this error on my rogue on 5.4., will there come any update of this add on? 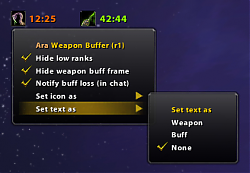 (*temporary) = "|cFFFFB366Ara|r Weapon Buffer - Ranged"
I am using this with ChocolateBar. When I mouse over the WeaponBuffer text, it pops up the little list of poisons I can use. However, when I move my cursor to click on the poison, the popup disappears. How do I apply the poison using the broker? New version is not playing nice with Aura Frames. It's forcing the blizzard buff frames to show up and causing conflict. This has happened since it was released, but I usually just ignore it and move on. I love all your plug-ins, thanks for your work. I haven't used this addon for a long time so I didn't check. I will try to post an update today. some time ago i stopped getting popups when my poison expired, anyone else have this problem? Is there anyway to show a pre-expiry warning? In the non-stop pace of raid, having your poisons fall off is extremely detrimental. Typically I like to replace them when there's still 2+ minutes left just to be sure they never expire. Do this feature exist within this addon? If not would there be anyway you could add it? Edit: I started using Cyanide Poison Reminder in combination with this addon. The 2 together are exactly what I was looking for. Last edited by Movarrin : 01-20-11 at 02:43 PM. There's one issue I noticed, which is that when a poison wears off the icon doesn't change back to default but still displays the poison's icon (I'm using Fortress btw). Last edited by merola : 12-10-10 at 04:18 AM. Will be fixed really soon. Thank you for reporting this issue. A typo (== instead of ~=) was restricting stones and some oils to wrong classes. Used to be able to use this to apply sharpening stone buffs to heirloom weapons (as well as others under ilevel 165). Now, it no longer recognizes/detects sharpening stones in a mid-level Warrior's packs in WoW 4.0.3 live (likely as of r13, but have only tested on leveling character here as of r16). Improperly states in its tooltip "No consumable available". But...when you manually buff with a stone, the mod timer still counts down properly. "Fixed consumable list to reflect the 4.0.1 changes" appears to need further fixing. Edit: "Hide low ranks" is not selected when it fails to detect any sharpening stones. Last edited by Zidomo : 11-21-10 at 10:36 AM. Thanks for all your hard work, Aranath! The third display was there, and it all works fine. Awww I forgot that annoying protection Blizzard put on buffs. I will temporarily remove the option that control the visibility of the weapon buff frame until I can fix it (and that the fix doesn't require a huge implementation of secure templates). Latest version is preventing me from right-clicking to remove buffs. I get the pop-up that the addon is trying to access a Blizzard protected function. It's already in. If it doesn't appear, check your display addon. Ah! Okay. I was basing it on the screen shots here, currently at work and don't have it installed (yet). Sorry to have wasted your time. I do have your guild & friends and trade skills mods loaded though, and based on them I was figuring I'd love this too.